Not many clubs get to escape the “Tech bubble” during their meetings, but that is precisely what the Jackets’ Sailing Club gets to do during their practices. The club sails out on Lake Lanier and tries to make it out there as often as possible. Sailing Club is divided into a social club, where people learn to sail and have fun, and a competitive team, which participates in races, called regattas. JD Reddaway, a fourth year CS major, is the Commodore, or President, of the Tech Sailing Club and has a long history with sailing. Reddaway has been sailing with his dad since he was young and got his first boat at seven. He has been competing since then and even qualified for the national team twice at 13 and 14 years old. Reddaway was keen on picking up competitive sailing again after taking a break in high school, and he sought out opportunites at Tech which eventually led him to the Sailing Club. On the other hand, Vice Commodore Alex Richardson, a fourth year BME major, has been sailing for just three years. She was driven by a desire to step away and take a break from academic life at Tech. “I feel like coming to sailing club and being able to get on the lake and get in a boat was my escape from Tech life. I was constantly in the Georgia Tech bubble, and I didn’t have a car, so the only time I could get away was to go sailing and have fun with friends,” said Richardson. “Having never sailed a college regatta before, I was just thrown into it. We flipped our first race, but we still managed to get it back up and beat a few teams,” said Chris Walton, the race team Captain and third year AE major, who has been sailing since he was eight. Josh Kim, the Secretary for the club and a second year ME major, has only been sailing for two years. He had sailed just once before college but wanted to continue once he came to Tech. “The first time I sailed at Tech was actually during a regatta with JD. But that’s what I love about the GT Sailing Club. We’re always ready to teach people who have never been on the water. I didn’t really know much, but JD, Chris and others taught me a lot,” said Kim. Kim echoed Richardson’s belief that sailing is a nice break from the coursework at Tech. “I feel like the thinking process in sailing is very different from engineering, mathematics and physics. So it feels like your brain sets free for a few hours while you’re on the water,” Kim said. 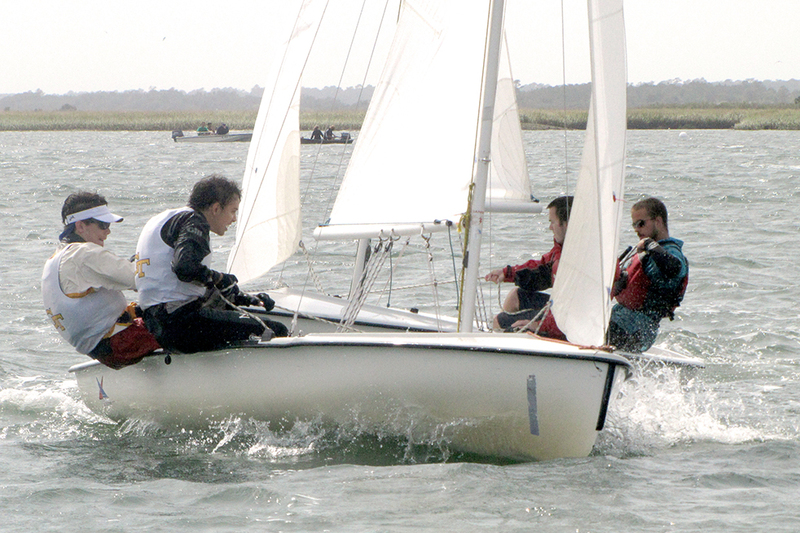 Tech’s sailing race team competes in the North Points division of South Atlantic Interscholastic Sailing Association (SAISA). Tech usually enters an A team and a B team, each composed of two sailors: the skipper and the crew. “The skipper is the guy driving the broad. He is in charge of the rudder, which is how you steer, and the main sail. The main sail is the big sail at the back of the boat. His main job in racing is to try and get the boat going as fast as possible,” said Reddaway. The other person on the boat is considered the crew, and that sailor’s job is to fly the front sail, called the jib. The crew is also on the lookout for the other boats on the course and for spotting where the wind will be. The regatta courses are varied, but a very common course is the windward-leeward course. “Windward is upwind, and leeward is downwind. They blow a whistle to let you know how much time you have. Then at ‘go,’ you start. The tricky thing is that if you’re over the line early, you have to restart the race,” said Reddaway. The boats cross the start line and zig-zag upwind. At the other end is a marker, which boats must turn around. Now, the boats are sailing downwind and can use the wind in their sails to sail in a more direct fashion. The boats then loop around a marker near the start line and continue on sailing laps. Much like golf, the goal is to finish as high as possible by earning as few points as possible. However, it’s the start of the race that is especially exciting for the sailors. “You’re trying to stay in a good position so you can cross right when the race starts… There’s a lot of shouting and right-of-way rules. Everyone’s coming close to hitting each other,” said Richardson. “The starts are definitely one of the most fun things but also most complicated and chaotic,” said Reddaway. The race team is looking forward to its current racing season, which includes both fall and spring semesters. There are many experienced freshman joining the team, and Walton believes that’s a big change from last year’s relatively inexperienced team. The goal for the fall is to get the new Tech sailors some experience in regattas. “College sailing is a lot different than normal sailing. For one, races are a lot shorter. You really have to get a good start and be on top of your game the entire race,” said Reddaway. The race team hopes to do well in the North Points division. That has Walton looking ahead to success in the spring. “The spring has a lot more of the bigger regattas. It’s when the district championships go off,” said Walton. The team hopes to finish in the top half of their semifinals group so that they can advance to nationals. Richardson wants to make sure that students who are interested in the club realize that not everyone has to go out and race competitively. The team has access to a lot of boats out on Lake Lanier, and many of them are never used. “The general club is much more relaxed. We go camping, we go sail and have cookouts. People learn to sail and have fun too,” said Richardson. The racing team, though, is getting geared up as their schedule starts to become more important. Charleston is the biggest competition in the North Points division, but NC State and Clemson have strong teams as well. And this season, Duke has come out of nowhere with some strong freshman talent to pose a threat. Tech finished second in a regatta at Clemson two weeks ago, where the A team finished first with just eight points. They sail next at the regatta hosted by the University of North Carolina on October 11th. The team holds race practices on Mondays from 3 to 6pm at Lake Lanier, and the club meets Thursdays in CRC 251 at 7:30 pm.